Taking place at the Boston Opera House in May, TEDxCambridge 2018 brought together 2,500 people to hear seven distinguished speakers share innovative new ideas during one inspirational evening. The responsibility of setting the stage for this prestigious event fell to Port Lighting who worked closely with the organizer to integrate lighting into a custom-designed set. This was in order to realize a clear vision, which had a very specific lighting requirement that was satisfied by seven of ADJ’s compact and powerful Vizi Beam RXONE fixtures. TED is a non-profit organization dedicated to spreading ideas through the form of short, powerful talks. Growing from a 1984 conference where Technology, Entertainment and Design converged, TED has expanded to cover almost every conceivable topic and reaches a global audience through its website and online video platforms. It also operates worldwide through independently-organized, but affiliated, TEDx events, of which the annual Cambridge gathering is one of the biggest in the world. Established over thirty years ago in 1985, which coincidentally is the same year that ADJ was founded, Port Lighting is a diverse entertainment lighting company based in Seabrook, New Hampshire, right on the border with Massachusetts. It has two key divisions, one offering production services for all types of events and the other providing permanent rigging, draping and lighting equipment, as well as, architectural lighting design and installation. 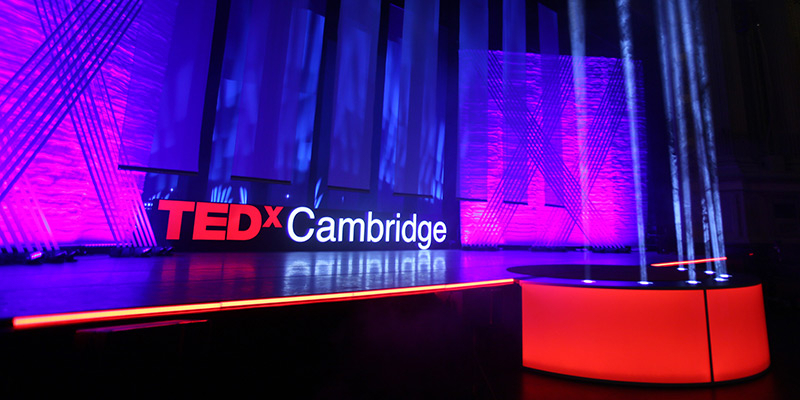 Port Lighting has been working with TEDxCambridge for the past two years, initially providing the lighting for their smaller VIP guest salon dinner events. This came about due to an introduction made between the event’s organizer, Dmitri Gunn, and Port Lighting’s VP of Permanent Systems, Ron Kuszmar, who soon built up a good collaborative relationship. It was this symbiotic relationship which meant that when the TEDxCambridge team decided to part ways with the company that had previously looked after the lighting production for their flagship Boston Opera House event, Port Lighting were offered the contract. And it was also the reason that Kuszmar was eager to accept the challenge, quickly diving into the task of bringing to life the very specific vision that Gunn had for the staging of the event. One of the signatures of TED events is a circular red carpet which provides the focal point from which speakers deliver their talks. For their 2018 event, Gunn and the TEDxCambridge team wanted to take this concept to a new level by creating a semi-circular thrust stage that allowed the circle of carpet to extend out beyond the edge of the venue’s regular stage. Furthermore, they wanted this extended stage fitted with lighting fixtures that would project tight beams of light upwards so that it would look as if speakers were standing on a dais of light. This presented the Port Lighting team with the task of sourcing a lighting fixture that would be compact enough to sit within the custom-fabricated structure while also offering enough power to create the dramatic effect that was called for in such a large space. The original plan was to use ACL fixtures, however the client also wanted the ability to color the beams and – because the units had to be encased in the stage – heat was also a consideration. After evaluating various options, Kuszmar decided on ADJ’s Vizi Beam RXONE moving head fixture. The quick-moving RXONE utilizes a potent 1R HTI long life lamp to create a super sharp beam of light capable of traveling up to 100 meters. This can then be shaped using a color wheel, GOBO wheel, prism and frost filter to create a wide variety of different effects. Despite its intense brightness, the fixture has a low power draw of just 199W, is extremely efficient – which minimizes excess heat – and is also incredibly compact. At the event, the Vizi Beam RXONE proved to be the ideal choice. It allowed the Port Lighting team to perfectly execute their client’s vision of projecting seven impactful columns of white light up from the front of the semicircular thrust stage as presenters made their entrance. Following this moment they then switched the beam to red, introduced the frost filter and faded down the dimmer so that during each talk the central circle of red carpet was surrounded by seven smaller circles of red light. They were then also able to exceed the organizers’ original expectations by introducing prism and movement effects to enhance other moments during the evening’s proceedings, including the pre-show which was designed to pique the interest of the audience and draw in their attention ahead of the official start.